Dan Duquette (born May 26, 1958) is the current General Manager of the Baltimore Orioles. He was previously the General Manager for the Montreal Expos (1991–1994) and the Boston Red Sox (1994–2002). He is also the founder of the Dan Duquette Sports Academy. He has twice been named the Major League Baseball Executive of the Year by Sporting News (1992 with the Expos and 2014 with the Orioles). Duquette is a native of Dalton, Massachusetts. He attended a Catholic grammar school in Dalton during which time he was a batboy for the Wahconah Regional High School baseball team. In high school, he was the captain of both the baseball and football teams. After high school, he attended Amherst College where he was a catcher on the varsity baseball team and a linebacker on the football team. In the summer of 1977 at the age of 19, Duquette helped organize the Dalton Collegians, a semi-pro baseball team that operated out of his hometown. In college, Duquette was chosen to the 1979 Boston Herald American All New England College Division All Star team. Duquette was also known to talk to professional scouts who attended Amherst baseball games. He graduated from college in 1980. After college, Duquette's baseball coach, Bill Thurston, recommended him to Harry Dalton, a fellow Amherst alumnus and General Manager of the Milwaukee Brewers. Duquette became a scouting assistant for the Brewers and worked in the scouting department for 7 years. In 1987, he was hired by the Montreal Expos as the Director of Player Development. He spent a few years in that position before being promoted to Vice President and General Manager in 1991 (taking over for the departing Dave Dombrowski). Over the course of his six years with the Expos, Duquette had a hand in drafting players like Rondell White, Marquis Grissom, Cliff Floyd, Jose Vidro, Kirk Reuter, Javier Vasquez, and many more Major League players. He also signed players like Vladimir Guerrero, John Wetteland, and Larry Walker. In November 1993, Duquette traded second baseman Delino DeShields for Pedro Martinez of the Los Angeles Dodgers. The Expos were competitive from 1992 to 1994, and they had attained the best record in baseball prior to the 1994–95 Major League Baseball strike that ended the season prematurely. In 1994, Duquette returned to Massachusetts to become the General Manager of the Boston Red Sox. He spent eight years at the helm of his hometown team. The Red Sox achieved a record of 656–574 under Duquette, setting attendance records and appearing in the playoffs on three separate occasions (1995, 1998, and 1999). The team won the American League East division in 1995, but only advanced as far as the American League Championship Series once in their three postseason years. They would lose that series to the rival New York Yankees. As the Red Sox GM, Duquette made several notable moves, including drafting Nomar Garciaparra in 1994 and trading for Pedro Martinez in 1997 (and signing him to a six-year, $75 million contract). He is also known for letting Roger Clemens leave in free agency in 1996. Many of the players that Duquette drafted or signed were on the Red Sox 2004 World Series championship team. He is largely considered to have laid the groundwork for that team by signing and drafting players like Tim Wakefield, Johnny Damon, Jason Varitek, Manny Ramirez, Derek Lowe, and Kevin Youkilis. In 2002, Duquette was dismissed from his general manager post less than 24 hours after the Red Sox had officially been sold to a new ownership group that included John W. Henry and Tom Werner. After his stint with the Red Sox, Duquette largely stayed out of Major League Baseball for 9 years. In 2003, he opened the Dan Duquette Sports Academy, a sports training center in Hinsdale, Massachusetts designed for children aged 8 to 18. In 2004, He became the owner of the New England Collegiate Baseball League's Pittsfield Dukes (later the Pittsfield American Defenders and now the Mystic Schooners). During his ownership tenure, the Dukes/American Defenders played at his sports academy in Hinsdale and later at Wahconah Park in Pittsfield. In 2008, he was part of an ownership group that included Buddy Lewis, Terry Allvord, and Jerry O'Connor that purchased what would become known as the American Defenders of New Hampshire, (later the Pittsfield Colonials). He relinquished ownership of both clubs in 2009 and 2010. Duquette also helped found the Israel Baseball League. Despite folding after only one season, it helped 75 players get into professional baseball. During this time, he also had a part in a production of the musical, Damn Yankees, in Western Massachusetts. After spending 9 years away from the MLB, Duquette returned as the General Manager of the Baltimore Orioles in November 2011. In 2012, the team made the playoffs for the first time since 1997. In 2014, the Orioles won the American League East with 96 wins and made it to the American League Championship Series. Many people attribute the success of the Orioles to the management of Buck Showalter and Duquette. Duquette signed Nelson Cruz to one-year, $8 million contract in February 2014. Cruz went on to lead the league in home runs that year. Other signings and acquisitions under Duquette have included, Nick Hundley, Delmon Young, Steve Pearce, and Andrew Miller. In early 2015, the Toronto Blue Jays expressed interest in making Duquette their new President/CEO. Because Duquette is under contract until 2018 and the Blue Jays did not offer enough compensation to the Orioles, no deal was struck. 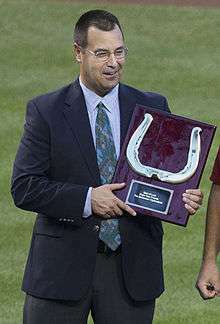 Duquette has twice received The Sporting News Executive of the Year Award (1992 with the Expos and 2014 with the Orioles). He also won the Baseball America Major League Executive of the Year honor in 2014 with the Orioles. Mark Armour and Daniel Levitt ranked Duquette the 17th best general manager in the history of baseball in their 2015 book, In Pursuit of Pennants: Baseball Operations from Deadball to Moneyball. Duquette is married to Amy Aubry-Duquette and has six children. He lived in Acton, Massachusetts, from 1994 through 2011. He currently lives in Pasadena, Maryland. Duquette's cousin, Jim Duquette, is a former executive of the Baltimore Orioles and the New York Mets. His other cousin, Pat Duquette (Jim's brother), is the head men's basketball coach at UMass Lowell. 1 2 Encina, Eduardo A. (January 26, 2015). "Thoughts on the latest in the Dan Duquette saga and incentives for Ryan Flaherty". The Baltimore Sun. Retrieved May 23, 2015. ↑ Connolly, Dan (November 8, 2011). "Duquette says he's up to challenge of turning around Orioles". The Baltimore Sun. Retrieved May 23, 2015. 1 2 3 Siegel, Robert (October 6, 2014). "Orioles General Manager Duquette: A Comeback Story Fit For Baseball". NPR. Retrieved May 23, 2015. 1 2 3 4 Encina, Eduardo A. (November 10, 2014). "Orioles' Dan Duquette named Sporting News Executive of the Year". The Baltimore Sun. Retrieved May 23, 2015. ↑ Klingaman, Mike (November 19, 2011). "Duquette is finally back in the only job he's ever wanted". The Baltimore Sun. Retrieved May 23, 2015. 1 2 3 4 Rohan, Tim (December 1, 2013). "3 General Managers True to One School". The New York Times. Retrieved May 23, 2015. 1 2 Eller, Brian (November 8, 2011). "Dan Duquette brings extensive resume to Baltimore". Mid-Atlantic Sports Network. Retrieved May 23, 2015. ↑ Powers, Jason T. (2014). Bringin' Gas And Dialin' 9: A Seven Score Addiction to the National Pastime. Deep Center Field Press. 1 2 "New Red Sox owners oust Duquette". ESPN. March 2, 2002. Retrieved May 23, 2015. ↑ Speier, Alex (November 8, 2011). "Dan Duquette's Red Sox draft record reconsidered". WEEI-FM. Retrieved May 23, 2015. 1 2 3 Chass, Murray (March 1, 2002). "BASEBALL; New Owners of Red Sox Quickly Fire Duquette". The New York Times. Retrieved May 23, 2015. 1 2 3 Kepner, Tyler (November 8, 2011). "For Duquette, a Chance and a Challenge". The New York Times. Retrieved May 23, 2015. 1 2 Sheinin, Dave (November 8, 2011). 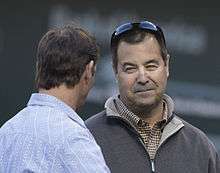 "New GM Duquette eager to turn around Baltimore Orioles". The Washington Post. Retrieved May 23, 2015. ↑ Herman, Howard (January 26, 2013). "Duquette Sports Academy director Kent Qualls joins Orioles minor league staff". The Berkshire Eagle. Retrieved May 23, 2015. ↑ Herman, Howard (September 19, 2014). "Dalton native Duquette makes most of second chance in baseball with Orioles". The Berkshire Eagle. Retrieved May 23, 2015. ↑ Dobrowolski, Tony (April 10, 2010). "Pittsfield baseball changes owners". The Berkshire Eagle. Retrieved May 23, 2015. 1 2 Singleton, Michael (October 10, 2013). "9 Questions: Dan Duquette – Executive Vice-President of Baseball Operations for the Baltimore Orioles". Severna Park Voice. Retrieved May 26, 2015. ↑ Shaugnessy, Dan (March 7, 2012). "Dan Duquette returns to Fort Myers with Orioles". The Boston Globe. Retrieved May 23, 2015. 1 2 Encina, Eduardo A. (December 2, 2014). 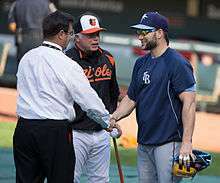 "Orioles' Dan Duquette, Buck Showalter earn honors from Baseball America". The Baltimore Sun. Retrieved May 23, 2015. 1 2 "Dan Duquette puts Toronto in past, focuses on Orioles". USA Today. January 31, 2015. Retrieved May 23, 2015. ↑ Meoli, Jon (January 22, 2015). "Dan Duquette ranked 17th best general manager in baseball history". The Baltimore Sun. Retrieved May 23, 2015. ↑ Tobey, Stephen (November 17, 2011). "Duquette returns to Majors with Orioles". Retrieved May 6, 2016. ↑ Abraham, Peter (October 13, 2014). "After long hiatus, Dan Duquette finds fit in Baltimore". Boston Globe. Retrieved May 26, 2015. ↑ Kanno-Youngs, Zolan (May 16, 2013). "Pat Duquette new UMass-Lowell basketball coach". Boston Globe. Retrieved May 26, 2015. Wikimedia Commons has media related to Dan Duquette.